Magic Roulette Intuition training software is designed to develop intuition to beat the roulette table. If you train on a daily basis, you will learn to correctly deduce winning chances, dozens and columns. With time, as you will see, you will make more correct decisions than incorrect ones. And their number will keep growing. After 1-2 months, the amount of correct answers can reach 80 to 90%. True, different people show very different results. Some perform better, some do worse. The most persistent can by dint of systematic training achieve the 100% level of successful results. And such an effect is no rarity. The fundamental thing is to have training sessions on a systematic basis. You will surely achieve your goal if you spend enough time training. Zero result is impossible. 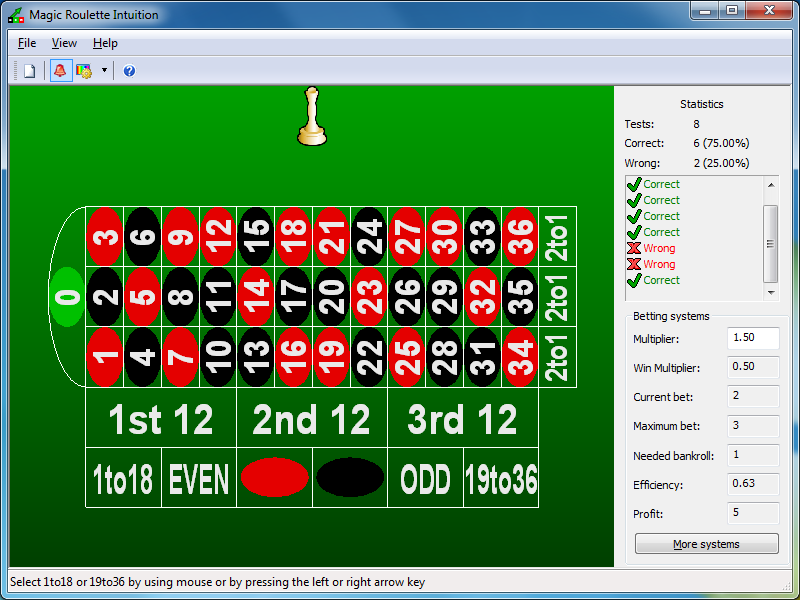 The software enables you to learn to deduce winning numbers. You can train deducing dozens, columns, chances. During training, after you make your choice, the marker moving to the winning number will show you the correct result. If your guess turns out to be incorrect, you will hear an unpleasant sound. That helps achieve better results because you will subconsciously be trying to avoid hearing that sound again. During each test, the winning number is not influenced by your answers as the software uses an advanced random number generator. Betting systems show you how much you can win. Is it possible to win playing roulette? Yes, it actually is, in the teeth of the 2.7% house edge. That has been proved experimentally using this intuition trainer, and later on real and electronic roulettes. To beat the roulette table, all you need to do is learn to foreknow more than 52% of the winning numbers. That result can only be achieved by practice using the intuition trainer. - Fully customizable color scheme. - Sounds for wrong answers. - Displays Correct vs. Wrong answers statistics.